Photo: Wonderboy has begun training for Woodley. Discussion in 'UFC Discussion' started by Essie, Aug 2, 2016.
lalaland, BenRichards, EJF1984 and 38 others like this. BenRichards, biscuitsbrah, Crimson Glory and 16 others like this. biscuitsbrah, MachidaNo1Fan, countswagula and 4 others like this. 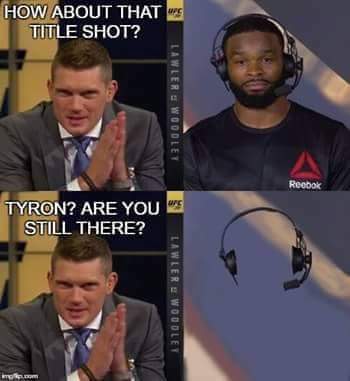 Calling Woodley a dog? Racist. Crimson Glory and Ryoto Machida like this. GBcrazy, TrainInVain, Ryoto Machida and 2 others like this. BenRichards, milk man, anthony stark and 42 others like this. Dogs come in all colors. Why did the dog have to be brown, TS? This heinous racism must end. Shouldn't it be wonder"MAN" seen as how he is now older than 18? Reported for blatant racism. One gun shot and he gasses out and falls just because the color of his skin?? Agent Mulder, mikehunt, Hearse Lightning and 1 other person like this. Jin Akutsu, Crimson Glory, Oku and 10 others like this. Surprised he didn't run in the octagon post fight and say Ok, now I'll come back. biscuitsbrah, HBLC, countswagula and 2 others like this. Tyron really looked ridiculous for doing this to Thompson. My god, wasn´t he the one complaining about people who thought he didn´t deserve the title shot after his time off and wanted to prove them wrong? Then, 10 minutes later he is trying to take Wonderboy´s chance away, someone who deserves 10 times more than he did? Wow, super consistent guy. In a scale of 1 to 10 of being an hororable guy and truthful to his word, I´d give him 3. Why would he fight him if he can get GSP? More $$$ and a bigger challenge.